Yesterday the September Feature Patch was released and, well…there’s a lot wrong about it. Normally when I’m writing about something I’m unhappy about I try to write about the positives first (and there are good things to this patch), but the bulk of it…yeah, I’m not too happy, and there’s a lot of big problems here. So much of the feature patch revolved around changing things to make it easier for new players (supposedly). The very first problem here is that there is little in the patch for veteran players that have been playing for some time. I understand wanting to focus some stuff on new players, but this patch really felt like it was largely ignoring those of us who have been playing for a long while. And while the guild updates are great ([TWIT] is finally the way it was meant to be since before launch! Well, other than NA/EU still being data-center locked…), and account-bound commander tags are nice and the new trading post is lovely…none of those are things that are going to really keep people playing. I enjoy Living Story, but even that’s not enough to keep me wanting to log in every day anymore, and especially not with the next chapter not coming until November. But the new player changes. Maybe it’s because I tend to not enjoy MMOs, or maybe it’s because I’ve been playing GW2 since BWE1, but I can’t see how any of these changes make things easier for new players. If anything, I feel like they’re going to make things harder. Skill unlocks now go by level. This had potential to be good or bad. Having seen the levels they unlock at…I’m going with bad. The one balance to it is that you automatically unlock that skill for every weapon at that level…but that said, it was much faster to unlock all your weapons the old way. You get your second weapon skill at level 2, third at level 4, your offhand weapon or fourth skill at level 7, and your fifth skill at level 10. Ten levels to fully unlock your weapon skills. Oh, and you don’t get to swap weapons until level 15. Your F1-F4 skills are also locked, and I’m going to be honest – I don’t even know where those unlock. I did have a keyfarming character at level 5 leftover from before the patch and when I checked her she had her F1 skill, but that’s it – the others didn’t even show up. So I’m going to assume that those start unlocking at level five. That’s annoying, as it then takes that much longer for a player to realize that their profession has specific skills like that, and it gets even worse when you come to rangers. I made a ranger just to see this for myself. That’s right – if you start a new ranger? You cannot control your pet at all. You cannot direct their attacks, you cannot use their F2 skills, you cannot call them back, you can’t swap them, and you can’t even set them to passive! So, everyone starting out a new ranger? I wish you good luck, as your pet will be even more dead weight than usual. Frankly, I think that this is going to turn even more people away from rangers. They’re already one of the least-loved professions…so, good job. Make people like them less. Makes sense. Utility skills have also moved at which level they unlock, and again…it isn’t an improvement. Skill seven unlocks at level 13, skill eight unlocks at level 24, skill nine unlocks at level 35, and you don’t get your elite until you’re level 40. Halfway through leveling up and you just get to start playing with an elite. Again, I don’t understand the logic behind that. Not only are those levels silly (what’s wrong with 5, 10, and 20? ), but every eleven levels is just far too long, and you won’t even have all of your skills by the time you’re of a level to start being able to poke at dungeons. It becomes worse when you compound that fact with the trait update from the April feature patch. It’s hard enough to play without any traits – and I’ve leveled two characters since the April feature patch. Even with lower-level areas being rebalanced to match the fact that you lack traits, those first 30 levels are a long slog to push through. Getting a single trait point at 30 helped a bit, but the larger help was having my elite skill available. Every profession is helped greatly by having their elite available. With some professions, it’s all but necessary. The characters I leveled that were made after April were a thief and an elementalist. I struggled with them quite a bit, and I’d leveled both of those professions before; my new ele was also my 12th level 80. How’s a new player going to feel trying to level? One of the other big changes was how personal story was changed. Now, people on the forums are reporting that later parts of the personal story are all a mess (apparently an entire storyline arc is completely gone), but as I’m focusing on the early stuff, I won’t really touch that. We all know how personal story was done before yesterday; it was always available to you, each step having a recommended level, but really you could do it whenever you wanted, so long as you could survive. If you wanted the challenge of doing it several levels early? Go for it! Well, not anymore. The story is now locked into chapters and cannot be accessed at all until a certain level. This bothers me, a lot. One of the things that I always loved about GW1 and GW2 is that it threw you into the story immediately – no silly grinding of early levels before you got to do anything interesting as is the case in so many other games. You got to start out the story as soon as you started your character. You cannot do that anymore, and it makes early levels feel…very empty. Almost boring. There’s a dearth of things to do, and where the UI formerly held your next story step, thus far it’s just been directing me from heart to heart. Get used to seeing this a lot. I don’t even dislike hearts all that much. Some are incredibly annoying, but they don’t bother me. I know a lot of players actively dislike them, and I know that the main reason they exist is to act like quests do in typical MMOs. But I feel like using them to carry early content is a bad idea. They really aren’t engaging content, and they don’t do a good job of showing off the game. Sure, personal story is far from perfect, but the racial parts – the first 30 levels – are in fact quite good. Part of me understands wanting to make it so you can play through it all in one go, but then they should have done something a bit different there. Unlock the first chapter at level 5, as just going through it straight will take you to level 10 easily, for example. Note how bare the mini-map looks there. No gathering nodes. Yes, that’s right. Gathering nodes have, apparently, been removed from very early areas. I don’t get these changes, at all. Rallying from downed state and dodging are pretty important parts of the game – those are huge mechanics that are pretty important to playing the game. Removing them (or the need for them) entirely from the first few levels isn’t going to make things easier for new players. I know there’s a new walkthrough system added into the UI – I was greeted by it when I logged into my mesmer yesterday, and one of the things it did was direct me to a specific area to practice dodging. And that is what new players need to get those concepts – but it shouldn’t be locked out until they’re starting to get used to playing, that should be something done right away so they do understand it and get used to it quickly. The other things…I just really don’t understand. Why were environmental items removed? Like, I get that they’re rarely used outside of events where they’re necessary, but they’re a pretty big part of early hearts. It seems completely nonsensical to take them out. 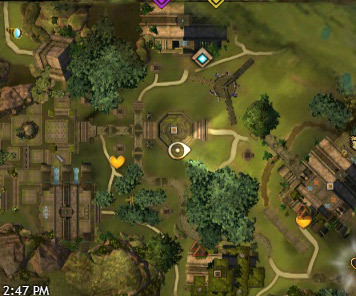 Same with gathering nodes – gathering is a good way to get both experience and money. Why remove these from the early areas? I can see a new player possibly being confused if they go up to a node and can’t gather it because they don’t have any tools – but if that happens, just put in a pop up that directs them to a merchant and explains gathering tools, instead of removing them entirely! Not to mention that this is going to have a negative effect on the game economy – potatoes are way up in price because essentially the only areas in the game they were available were starter zones, and I wouldn’t be surprised if green wood and copper starts to go up since many of those nodes are now gone. I’m sure there’s even more that I haven’t even come across yet. But I just can’t understand why most of this was done. If it was being noted that new players were struggling with certain things, then more effort should have been put in to explain these things – not delaying when they come into play, which I just see being even more confusing for newer players. If new players were having trouble with dodging, teach them how to dodge. Teach them what downed state is and how to rally. Teaching people how to do things is much more effective than simply…dumbing it down early on and delaying the bigger, more important mechanics until a later level. I don’t know. I really don’t. But I do know that this makes me unlikely to want to make or level new characters, which is something that I truly enjoy doing in this game. I just…I don’t get it. I don’t like it. And I can’t imagine this being helpful at all for new players, despite that being the intention.